Just when you thought you had seen it all, a new challenge jumps up to bite you. 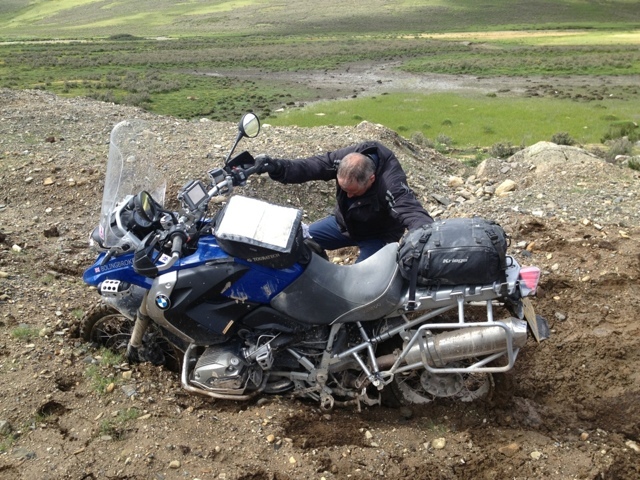 Today was another "straightforward" day which is just as well as it was 450km from Batang to Kangding. A long day but we were looking forward to some more of those lovely tarmaced passes. The road was good over the first pass (4700m) and down the other side. However it wasn't quite finished and we arrived just as they shut the last 500m so that they could lay the top coat of tarmac. What to do? Sit and wait for two hours or take a detour through the water meadows to bypass the works? Snowy had to wait but the adventure bikers were off road faster than you can say Gelande Strasse. Sadly 350kg of 1200GS and rider will not skim lightly across a bog and soon there were several bikes up to their axles in the mud. Once free they still had to climb back to the road, the last metre of which had been imported from the Somme. Carnage ensued with bikes being dug out, manhandled and ridden through the quagmire. By the time we were past the obstruction one of the lorries had moved and the last two bikes were simply driven along the new road. Typical! The fun wasn't over yet. The next two high passes were "under construction". As previously this means the old road hasn't been repaired in years and is now carrying all the construction traffic for the new one. The recent rain had turned parts of it into mud and puddles and the rest was churned to dust. Very hard, rough riding for 280km. By the time we arrived at the Love Song Hotel (!) 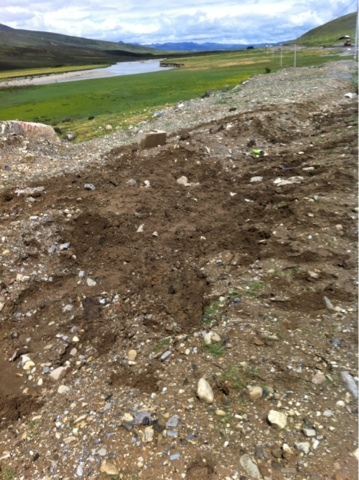 in Kangding we had been riding for 11 hours. Undetered Prof Sam and Deefor went out for a Szechuan Hot Pot dinner. This local take on fondue puts a huge pot of sesame oil, chilli, Szechuan pepper and ginger in the middle of the table. Diners put the meat of their choice in it to cook. It is quite simply the hottest thing "In The World".